'Coup De Ville' (Mary Dunn, R. 1990). 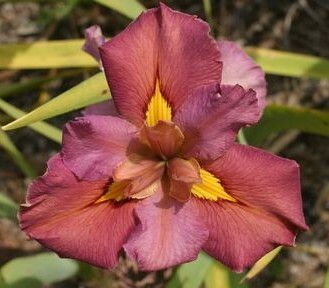 Seedling L117-2. LA, 32" (81 cm), Midseason late bloom. Standards and style arms light rose; Falls copper rose, large yellow green signal rimmed darker. 'Ann Chowning' X 'Monument'. Bay View 1991.